When site visitors choose to fill out a form on your website, marketers should use a strategic series of next steps to steer them toward making a purchase. Without those steps, your biggest opportunities become another list of names collecting cyberdust. A lead nurturing sequence works on your behalf, turning leads into qualified opportunities and/or customers by delivering automated marketing messages and triggering your sales department at the right time. When lead nurturing is done right, it’s relevant, helpful and one of your most powerful marketing tools. If you don’t know where to start, or you’re afraid of annoying your valuable contacts, we can help. A lead nurturing sequence is an outline of the action you want customers to take, including an automated process to drives them toward an outcome or goal, such as making a purchase. If you already have lead nurturing sequences in place, we’ll begin by auditing them, providing recommendations and implementing the changes. If you’re starting fresh, we can map out a custom strategy for your business, then put it into action with a tool like HubSpot or Mailchimp. Our team begins forming your lead nurturing sequence by using the typical journey of your buyers to define the actions that usually happen before a purchase. Once we have an in-depth understanding of the information your leads need during the buyer’s journey, we can write and design a series of automated emails using related content offers and topics to guide their actions. As your leads are being driven down the inbound funnel with a custom lead nurturing sequence, we’ll use A/B testing and best practices to analyze and maximize your results. Like everything we do, your buyers are always our focus. We’ll help you to create the right lead nurturing sequence for them, not just what’s easy. Get social media advertising to work for your brand with help navigating the ever-changing algorithms of each channel. Humanize your brand and increase conversions with a team that creates videos for your business using smart marketing strategies. Search Engine Optimization is complicated, but it doesn’t have to be mysterious. Let our team of SEO experts help you set up and maintain a successful SEO strategy. 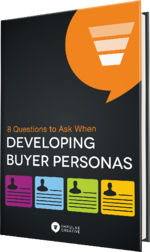 This free eBook will help you find out exactly who those top customers are and how to target your marketing campaigns to them.